introduced our audience to the Maker Movement, its importance and how to get started “making” in your classroom. We believe strongly in the educational, social and entrepreneurial aspects of the Maker Movement, so we plan to have a number of blog articles encouraging its adaptation to the classroom and education in general. Sign up to have interesting projects and events about the Maker's Movement sent to your inbox weekly. You can do that midway down the page found: HERE. 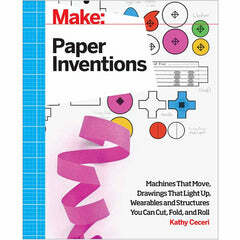 There is a great book that is available on the Make Magazine website as well as on Amazon. Here is a detailed description: "Paper is incredible stuff. It’s easy to cut, but incredibly strong. It’s disposable, but can last for centuries. It can stand as stiff as a board, pop up like a spring, or float like a leaf. And its invention changed the world forever. Perfect for students, parents, and educators, Paper Inventions is a project-based book with full color illustrations, step-by-step instructions, supply lists, and templates that allow you to follow along with the book or devise something entirely new. Each chapter features new projects that will challenge and intrigue everyone, from beginning to experienced Makers. The invention of paper changed the world. Learn about the science and history of papermaking and how to use simple chemistry and physics principles to make it move. Let paper change your world." This is another book suggestion. Again, available on the Make Magazine website as well as Amazon. Here is a detailed description: "After-school and out-of-school programs—as well as home schooling—have been growing steadily for nearly a decade, but instructors are still searching for high-interest content that ties into science standards without the rigidity of current classroom canon. 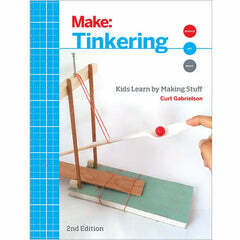 The author draws on more than 20 years of experience doing hands-on science to facilitate tinkering: learning science while fooling around with real things. Updated with new photographs and in full color, this second edition is even more accessible to young Makers, educators, parents, and Makers who are young at heart." 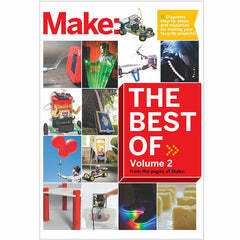 This book has sixty-five of the best projects and skill-builders published in Make: Magazine over the last eight years. You can order it from the Makershed or from Amazon. Here is a description: "Now in its 10th year, Make: magazine leads and shapes the new Industrial Revolution that is the Maker Movement. The second volume in our Best of Make: series, this collection gathers together the best projects published in Make: magazine over the last six years. Ranging from advice on tools and hacks to step-by-step electronics projects to the exciting world of microcontrollers, this volume covers such personal fabrication technologies as 3D printing and CNC milling; the mechanics of robots and drones; the possibilities of music and audio; new advances in photography and video; plain old fun and games; and the pleasures of crafts and wearable technologies. Make your own food, soap, ink, and more! Maker summer camp programs are available all over the world. See if one is in your area: Click Here to find a location. See the kind of activities going on at Maker Camps worldwide by looking here. See if there's a Make Faire in your area this summer. You can check by clicking here. To get a better understanding of what you'll find at a Maker Faire, watch the video here.